An employee’s first day is one of the most critical, largely due to all the new hire paperwork. Employers are eager to get employees up and running as quickly as possible, but they also understand the importance of handling the required paperwork properly. Our new I-9 & W-4 app recognizes these demands — and takes a streamlined, modern approach to new hire paperwork. It automates the process of completing and filing two essential forms — the Form I-9 to verify U.S. work eligibility and Form W-4 to calculate federal income tax withholding. In addition to breaking down form completion into manageable, easy-to-follow steps, it provides the added security of compliance with federal USCIS and IRS requirements. We introduced HRdirect Smart Apps in 2016 to simplify the many frustrating, but necessary, employee management and administration tasks small businesses face. Before going to market, our experienced in-house team of experts rolled up their sleeves to identify exactly what small businesses need, and how we could meet those needs without all the extras that typically come with overwhelming, all-in-one software systems. Research, planning, development and collaboration to accomplish a single, shared goal: Give employers the flexibility to complete tasks and solve problems on the spot. The new I-9 & W-4 app does exactly that. It’s laser-focused on form completion so businesses can get the job done promptly and precisely. The creation of the app was prompted by the 2017 Form I-9 changes and release of an updated, fillable PDF from the USCIS. Even though the PDF included enhanced tips and guidance, it still opened the door to questions and potential, costly mistakes. Our new app cuts through the complexity with clear instructions and validation that reduce, if not eliminate, uncertainty and errors. Because the Form W-4 is another requirement for new employees, it made sense to bundle the two forms for a seamless onboarding solution that satisfies federal compliance requirements in one quick step. Design and functionality hold a lot of weight with online apps. 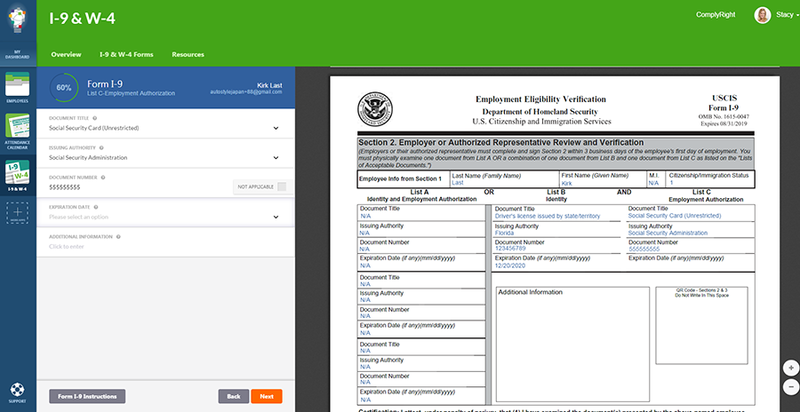 The look of the new app, with built-in instruction that automatically fills the government-issued form beside it, was designed to ease the transition from traditional forms to an online Form I-9 and W-4 process. Customers can navigate the app with all the familiarity of the paper forms they’re used to, while enjoying the immediate benefits of an automated, paperless and legally approved process. The learning curve is minimal — something every busy employer can appreciate. Further, the app works independently or together with other Smart Apps, so it can be used alone or connected with additional Smart Apps later, if necessary. With HRdirect Smart Apps, it’s never been easier for time-strapped employers to solve problems and complete daily employee management tasks. And now, with the introduction of the I-9 & W-4 app, managing new hire paperwork can also be a smooth, painless and risk-free process.